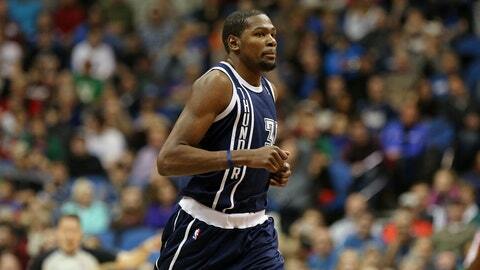 Jan 4, 2014; Minneapolis, MN, USA; Oklahoma City Thunder small forward Kevin Durant (35) looks on during the first half against the Minnesota Timberwolves at Target Center. Kevin Love, Nikola Pekovic and the Minnesota Timberwolves were ganging up on Kevin Durant, and a rare three-game losing streak for the Oklahoma City Thunder was just over the horizon. "I just hear a lot of stuff and I just wanted to come through for my team in the fourth quarter," Durant said, an apparent shot at some trash talk he heard from the Wolves’ bench. "I was more upset about the first one I missed," Love said. "I left it short. I think they were flat and short. There was no real air under them. Just missed them." "I was hanging my head a little bit in the first half and my teammates got on me about it," Durant said. "So I just wanted to keep my head high no matter what and stay aggressive and I was able to hit a few." "The special ones can have a poor shooting night and come down at the end of the game and make four or five to win the game," Thunder coach Scott Brooks said. "That’s how they’re wired because they’re great players. He loves to inspire his teammates with his play." "I’ll take K-Love in that situation no matter what," Wolves forward Corey Brewer said. "He missed them tonight. Next time he’ll make them." NOTES: Kevin Martin had 17 points and six rebounds for Minnesota. Oklahoma City committed 22 turnovers, but scored 24 points off 15 miscues by Minnesota. … Timberwolves first-round draft choice Shabazz Muhammad will start a four-game stint with Iowa in the NBA Development League on Sunday.